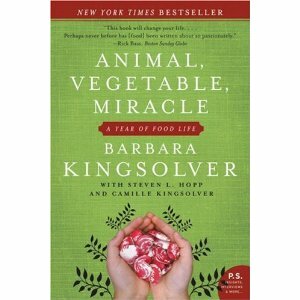 If you are at all interested in living in a sustainable way, love local food and want to be apart of the growing slow food movement, read this book: Animal Vegetable Miracle by Barbara Kingsolver. You don’t have to try to attain 100% of what she does in the book, but reading it will inspire you to think differently about the food you put on your families table (and in your mouth). Kingsolver is a well known novelist (The Bean Trees and The Poisonwood Bible), I haven’t read anything else of hers but having read this book, I am sure her fiction is a wonderful experience to read. Animal Vegetable Miracle is a non-fiction account of her family’s experience to grow their own food and source everything locally for one year. The book has three authors, Barbara is the main one, and she actually has a graduate degree in ecology and evolutionary biology. Her husband Steven is an environmental studies professor and her daughter Camille is one a very inspirational young adult. The book is full of recipes, meal plans and has a wonderful website where you can also get them from, click here. We do okay in the arena of slow food, we’re not perfect, that’s for sure, but conscious of our choices and more so every day. I am very happy to pick fresh lettuce from the garden on my way into the house after work, but come winter, it is tough in Alberta. The farmers markets keep us going and it is amazing what they are growing in hot houses these days. I encourage you to pay closer attention to the seasonality of your food. Watermelon in the dead of winter, not so kind. The watermelon we had recently, very yummy and it didn’t travel that far to get to us (although, it certainly didn’t grow up on the prairies). What are you reading this summer? Maybe this is the book for you.